Processed medications await pick up at the pharmacy on Ellsworth Air Force Base, S.D., Oct. 25, 2011. Pharmacists in the 28th Medical Support Squadron carefully screen all medications to ensure quality product is supplied to their patients. 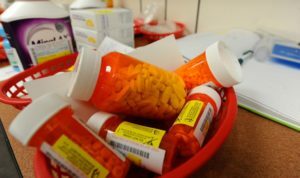 October 29, 2011 is the next take back day for your prescription drugs. The following website will give you the contact information for this great program! How tidy is too tidy? Clean Out, Clean Up and Shred Those Pesky Papers!